Accept my respectuful obeisances. All glories to Srila Prabhupada. There is a rather heated debate on this subject on various social networks of which you are certainly aware. I follow it a bit distractedly. Without this wanting to give the impression that I think to be smarter than everybody else, this reminds me of those two who settle themselves at the ends of a large 6 painted on the floor. One sees it 6 and the other sees it 9 and continue to bicker “it is a 6”, “no, it is a 9”. If only they were to exchange darsana (point of views), they would see that they are both right, that it is six if we look at it “from the south” and nine if we look at it “from the north”. Now I present my point of view. Vedic culture describes with great detail the physical, psychological and emotional nature of women in general and it is clear that the average of them is not suitable for certain roles and they are more suitable than men for others roles. In the context we are talking about, the woman is not suitable for being a Guru, just as she is not suitable for being a warrior, a mason or other roles. 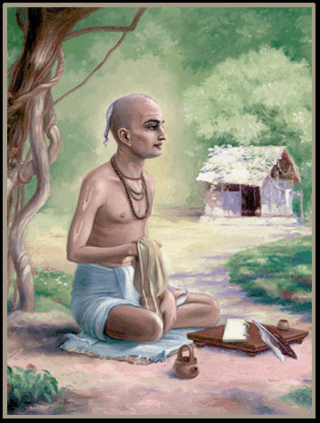 Thus Vedic culture prescribes various duties called stri-dharma. In Vedic society everyone has their dharma by observing which one can reach higher planets and eventually pure devotional service. Furthermore, chastity is an important principle. Man is generally exaggeratedly lusty for sexual pleasure and this generates disarray in individuals and in society. Arjuna speaks of it in the first chapter of the Bhagavad-gita. Thus the close association between Guru woman (with her specific nature) and man disciple can cause damage. Various other factors should also be taken into account, but here I want to talk only about general principles. If a Vaisnavi (woman devotee) is so advanced to be dis-identified from her subtle and physical body and has realized that she is only a servant of Krishna, there is no reason to stop her from initiating disciples. It would be called a drishta, a material perspective. In Upadesamrita (#6) Srila Rupa Gosvami is clear on this point that the devotee should not be seen from the material point of view and says that all imperfections (budbuda-phena-panka, in a Ganges analogy) must be neglected. In this context, for “imperfections” we mean “limitations due to one’s own feminine nature”. 2) the other established by the Vaisnava society in which the woman no longer identifies herself with the material body. Depending on the subjective circumstances, one concept or the other may apply. In history we had “Guru women” with many disciples (I mention here only Jahnava Devi, Isvari and Gangamata Gosvamini), not to mention the way Srila Prabhupada treated his female disciples, not very different from the way he treated his men disciples. Someone will say, but they were few. To this I reply by saying that even if there was only one, her presence would have excluded a total prohibition to the effect of prohibiting women Guru. And the fact that there were few of them gives reason to the first perspective, where we said that feminine nature is not favorable to the position of Guru and that even very advanced Vaisnavis prefer to let “the men” do this service. In conclusion, if we want a “vedic-varnasrama society” women should not be Gurus nor any other posts of leadership. If we want a Vaisnava society it would be a mistake and an offense to establish the principle that a Vaisnavi can not give initiations because she is a woman (dehino ’smin yatha dehe…). From the latter point of view, just as a woman can’t identify herself with a woman to be Guru, the same applies to men. Whoever thinks to be a man or a woman, white or black, American or Asian, handsome or ugly, and so on, is certainly not qualified to be Guru.